Hi There, I am sure this is going to be a very popular pattern!!! Beautiful!!! Hi AMarie! Thanks! I figued if I needed one someone else might too! Love the color way of the brown, blue and light blue!! So pretty. Cute pattern too. Hi Darlene! Thanks, my mom did too! Where did you get the Sugar-n-Cream yarn? I haven't been able to find it anywhere. Hi Carleigh! I got mine at Michaels, but I know they have it at Joanns too. Wal-Mart has a cotton yarn me as well. It's not the same brand but it works the same. Hope this helps! Hi! I think you could add a little stylus pocket to the side of the case, and that it would look really cute! LOL!! Hi! Thanks! I did too! Hi! Um, the CYC weight of the yarn is a 4. I'm guessing that is about the same as what you're asking?? I did a google search, so I could compare grades versus weights, but I didn't find that information readily accessible... I don't know if this helped or not, but I hope it did! LOL!!! Nice phone covers. Looks like cotton yarn is used. Easy and fast.. love it. Nice cover. 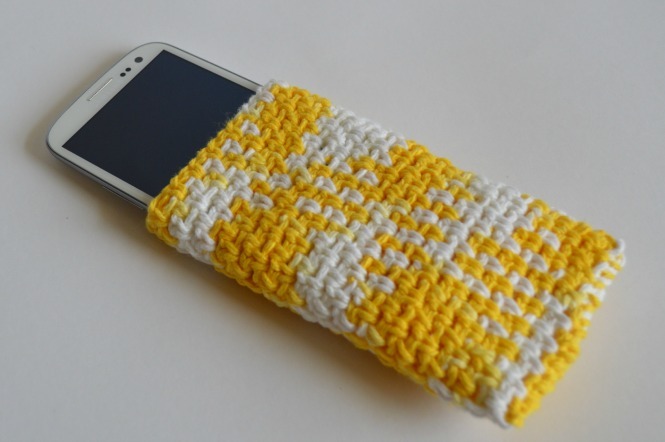 I am thinking about making one for my galaxy note 2. I love working with cotton. it doesn't have as much give but the colors are so much more viberant. Nice cover. I am going to make one. I plan to add a flap to the back so I can close it with a button or velcro. Thanks for the inspiration! I made up one last year but use it with an extra large sturdy safety pin to use it as an external pocket for pants that have no pocket or shallow pockets. It's been a great way to keep my phone handy with no worries of dropping it. Hi Jaime! I started the Galaxy S3 cover last night and I may have misread the pattern. 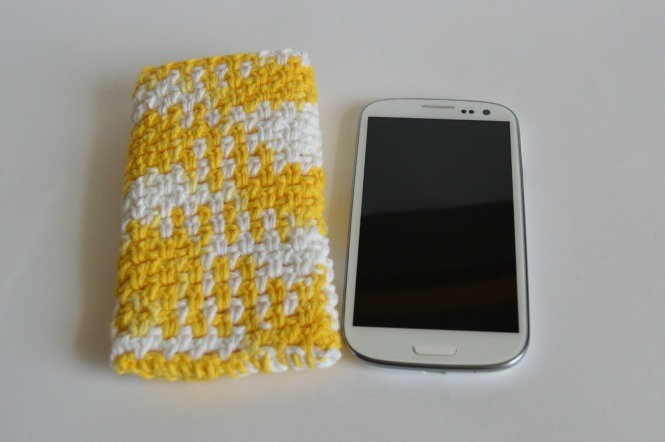 I crocheted 14 rows as the pattern says, but the measurement was only 3-3/4" tall. I measured my friend's Galaxy S3 and her phone is 5-1/2" tall by 2-3/4" wide. Help! What have I done? I love this but how many more stitches would have to be added if I wanted to do the Galaxy note phone which is a tad bit bigger than the Galaxy S3? 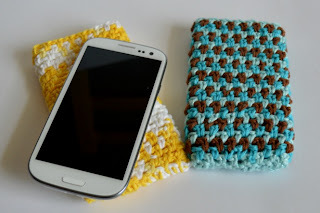 Very easy pattern! I made it today and using it also. Hi there! good post. article is loaded with wonderful information. We are providing Best case for ipad.